You work hard making your house a home, and that often can leave little time for cleaning. Let Sears Maid Services take care of the cleaning for you. All of our locally trained professionals know exactly what it takes to keep your home sparkling. Whether you require a one-time deep clean, like spring cleaning, or if you require a regularly scheduled service, we are there to help and can work with your schedule. Our professional cleaning staff is fully trained to clean bathrooms, toilets, ovens and much more. Give us a call at (740) 201-1209. Today's workday isn't always predictable, making it hard to schedule time for typical cleaning tasks. Sears Maid Services recognizes that you may require different scheduling which is why we offer weekly, bi-weekly and monthly schedules that work for you. No matter what your schedule is, our experienced cleaning staff can ensure your home or apartment is clean when you get home at the end of a busy workday. Sometimes you just need a one-time service that goes above and beyond our regular thorough service. We understand and offer a Deep Cleaning service for this precise situation. Whether it is for spring cleaning or to help prepare for or clean up after a large event, we can help. Sears Maid Services understands that you take pride in your business and care about your employees. Let us help convey that message with professional cleaning services. Sears Maid Services are available to motivate employees, boost morale and help draw in more customers by ensuring your place of business always looks its best. Our staff is trained in the expert techniques to keep staff rooms and restrooms clean and sanitized, empty trash cans, keep surfaces free from dust and more. Having a new home professionally cleaned is one of the last steps in new home construction. After all the contractors have left and before you hand over the keys to realtors, inspectors or potential buyers, Sears Maid Services will provide a thorough cleaning to ensure all parties are satisfied with the completed project. 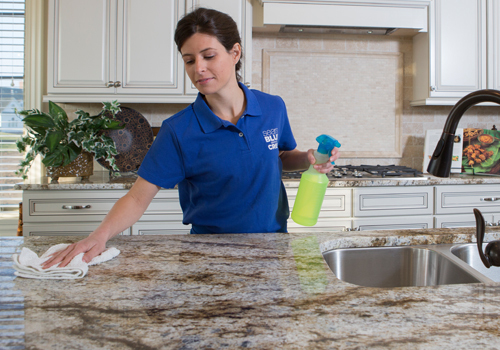 Our experienced house cleaning experts will remove dust and debris, wash and sanitize surfaces, vacuum and more. After all the carpet has been laid and fixtures and fittings have been installed, call Sears Maid Services to ensure your newly constructed home makes a great first impression and passes all inspections. You wouldn't hand over the keys to your home to just anybody, which is why we take trust and responsibility very seriously at Sears Maid Services. We work hard to build long lasting, trusting, professional relationships with each and every client, which is why we vet each and every employee prior to hiring. We perform multiple screenings and background checks on all of our staff. Our due diligence doesn't stop there. Once hired, we provide employees with off-site training so that they are fully prepared when they come to clean your home. We're so confident that our system works, that we guarantee all of our cleaning services. If you are not completely satisfied, simply give us a call within 24 hours of your last appointment and we will send out an inspector right away. If we missed something, we will ensure our professional staff returns to clean again whenever it is convenient for you.